Cars Land opened to the public in 2012 as the 8th "Land" at the Disney California Adventure theme park at the Disneyland Resort. The themed area is based on the Disney Pixar movie Cars and authentically recreates the animation set in great detail from the red-rock backdrop of the Radiator Springs Racers to the not-so-tippy tractors in Mater's Junkyards Jamboree. You'll feel like you're stepping right into the movie. Kids who are addicted to the movie will be completely enthralled, and adults will be enchanted too. 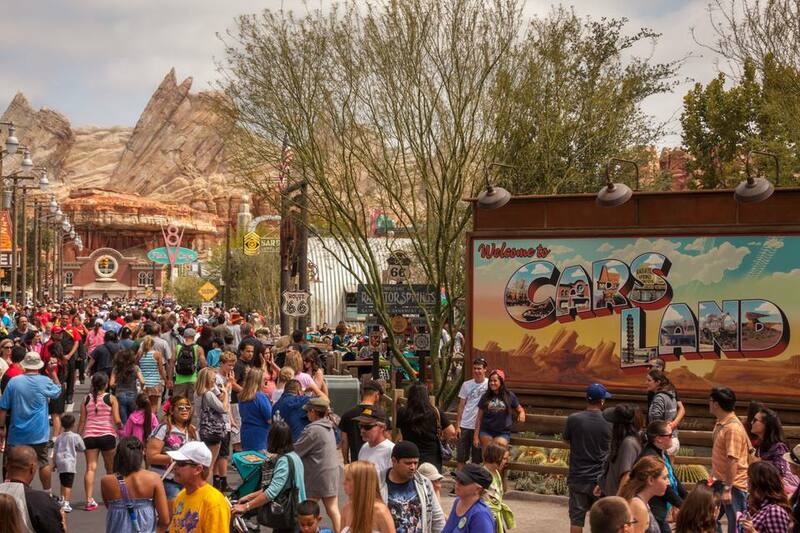 Cars Land has three rides, a restaurant and two snack bars, and three gift shops. The main entrance to Cars Land is just past the entrance to "a bug's land". There is another entrance at the back of Pacific Warf. Here's a photo tour and details on the rides and attractions you'll find in Cars Land. Mater's Junkyard Jamboree is the first ride you'll encounter on your left as you enter Cars Land. The theme is obviously Mater's Junkyard and the ride lets you ride baby tractors that do-see-do around in a square dance pattern. It's a lot of fun, but a little jerky. The Cozy Cone Motel in Cars Land is a snack bar where all the snacks are served in cones and have some kind of a "cone" theme, like ice cream cones and chile "Cone Queso." All of the three chili varieties - "cone queso," chicken verde and vegetarian, are quite good, as well as the pretzel balls with cheese dip. The pomegranate limeade is yummy and not too sweet. If you like sweeter, the apple drink in the pretzel cone is good too. The Cozy Cone also hosts meet and greet opportunities with Mater and Lightning McQueen, an opportunity to use the Disney PhotoPass if you have one. Luigi's Rollickin' Roadsters replaced the Luigi's Flying Tires ride in Cars Land in early 2016. The entrance to the ride is through the Luigi's Tire Store. The new ride is built on the same hovercraft technology as the previous ride, but it's more entertaining. The colorful roadsters dance around to a tarantella and other music. Kids will love the photo ops with a talking Mater, Lightning McQueen, Red, the Fire Truck and other character cars in Cars Land. Look for the character meet and greets to happen on the driveway of the Cozy Cone Motel. If the park is exceptionally crowded, they may be moved to other areas. Mater sightings at the Cozy Cone may be rare, as he has to rest up between appearances in the Pixar Play Parade. Learn about the Disney PhotoPass to have all your Disney memories recorded for you by park photographers. They've done a great job of recreating Flo's V8 Cafe in Cars Land. Every outdoor table has a fuel pump. The neon at night is spectacular! From the menu items, the pork, mashed potatoes and coleslaw seem to be favorites. The Radiator Springs Racers ride is really what Cars Land is all about and has the biggest footprint, covering almost half the area of Cars Land. Radiator Springs Racers is one of the most popular rides of both the Disneyland Resort parks. The recreation of Ornament Valley, the red rock landscape of the movie, based on the scenery in Arizona and Utah is breathtaking. The combination of dark ride with animated characters and night scenes and race through the outdoor countryside is stunning. You'll want the experience of riding both during the day and at night. During the day, you have a contrast between the indoor night scenes and sunny outdoor race. At night it's more of a seamless experience as you race around through the lit landscape. FASTPASS: Yes, near the entrance to "a bug's land"
Accessibility: Accessibility: Guests must transfer from wheelchair; handheld captioning devices are available. Physical Considerations: There is a physical risk warning on this ride. Seats in the ride cars of the Radiator Springs Racers are three across, so there's a single rider line. If you don't have small children with you, you can save a lot of time by using the single rider line, which goes a lot quicker than the main line. You usually end up riding at the same time, or the next ride. And the race is on as two cars race through the red rock landscape of Ornament Valley in the Radiator Springs Racers in Cars Land at Disney California Adventure at the Disneyland Resort in Anaheim, CA.